Practice One - Red defends in box re 2 srtikers. Blues & Reds outside box compete to link with strikers in box who when possible receive & turn to shoot or shoot one touch. Practice Two - Strikers then link with who ever play ball to play back and shoot outside the box. Practice Three - Reds and Blues combine to achieve a position in the magic square on right or left side for striker to score. 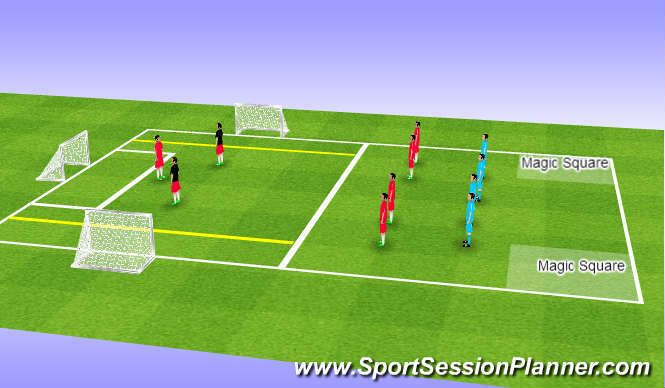 Practice Four - Game attacking small goals with line drawn to score outside of. Players were tired after the week-end so tempo was poor, technical ability was good, support re angle and distance was average. The practices were designed for shooting in the box & outside. Power disguise etc. The varied practices were designed to make the players think & work on quick play forward. Anaerobic and aerobic running, physical balance to shoot. Good effort considering players were very tired and were positive in terms of improvement.